The life of any comic book hero would be a lonely one if not for the many characters who have made up their supporting cast. Just as Superman has Lois Lane and Batman has Alfred, Booster Gold has also shared his adventures with quite a few people over the years. Today we look at one of those, Daniel Carter. After a gruesome injury ruined his promising football career, Daniel Carter had became stuck in an unfulfilling job as Evergreen Insurance Company's fifth-best term-life salesman. He dreamed of being a super hero and reclaiming his lost glory. Perhaps it was that dream — or maybe it was fate — that lured him to Booster Gold's sparsely attended funeral in 52 #18. Daniel was completely unaware that Michael Jon "Booster Gold" Carter was his descendant until Skeets told him the truth. Unfortunately for Daniel, that was the only truth Skeets told him (52 #19). Skeets wasn't Skeets at all, but the villainous Mr. Mind in disguise. Fortunately for Daniel, Rip Hunter was already aware of Mr. Mind's schemes. Hunter enlisted Daniel to become the second Carter to don the mask of Supernova, world-famous super hero. Together with faked-his-own-death Booster Gold, Daniel defeated Mr. Mind and saved the multiverse (52 #52). Daniel Carter's dreams had come true! Afterwards, Booster and Daniel became roommates (Booster Gold Volume 2, #1). Though Daniel meant well, he was also rather stupid. He was often left behind while Booster was out adventuring. This made it easy for Booster's ne'er-do-well father to steal the Supernova costume and use it for evil (Booster Gold Volume 2, #2). 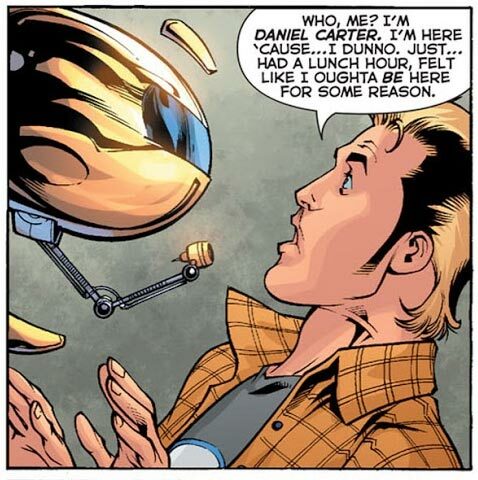 It would also present the opportunity for Daniel to meet his future wife, reporter Rose Levin, when she came snooping into Booster Gold's personal life (Booster Gold, Volume 2, #3). Rip Hunter would eventually recover the Supernova costume, and Daniel would continue to play the role of hero for Rose. He traveled through time to find his wife the perfect gift — and only accidentally gave longtime Justice League foe Starro the Conqueror the ability to conquer all history (Booster Gold, Volume 2, #13). He would redeem himself by protecting Rose from a maurading Black Lantern Blue Beetle in Booster Gold, Volume 2, #27. Supernova hasn't been seen since Flashpoint, but so long as Booster Gold is still around, Daniel and Rose have to be out there somewhere. If Booster Gold had four dollars and earned ten more, how many dollars does he have in all? I Am Living Proof. Beefcake! Booster Gold's ancestor Daniel Carter shows his future wife, Rose, the goods. Panel from Booster Gold, Vol. 2, #3, 2007. Art by Dan Jurgens and Norm Rapmund. huh, maybe its because I don't make a habit of looking at guys in their underwear, but I just noticed his boxers have footballs on them. now I want a pair of boxers like that. It may not be Booster, but heck, Daniel is a completely acceptable choice! If you had ten dollars and then spent six dollars on Booster Gold comics, how many dollars do you have left?